Grails is a very popular Groovy/Java framework amongst Java developers worldwide. We, at JVM Host can see increasing interest in Grails hosting too. In this tutorial we will show you how you can build and host a simple database driven Grails project with our Tomcat Plus 128MB heap package. Grails is an open source web application framework which uses the Groovy programming language (which is in turn based on the Java platform). It is intended to be a high-productivity framework by following the coding by convention paradigm, providing a stand-alone development environment and hiding much of the configuration details from the developer. Rapid - Have your next Web 2.0 project done in weeks instead of months. Grails delivers a new age of Java web application productivity. Dynamic - Get instant feedback, see instant results. Grails is the premier dynamic language web framework for the JVM. Robust - Powered by Spring, Grails out performs the competion. Dynamic, agile web development without compromises. As of November 2011 current stable version is 1.3.7 and development one is 2.0.0.RC1. 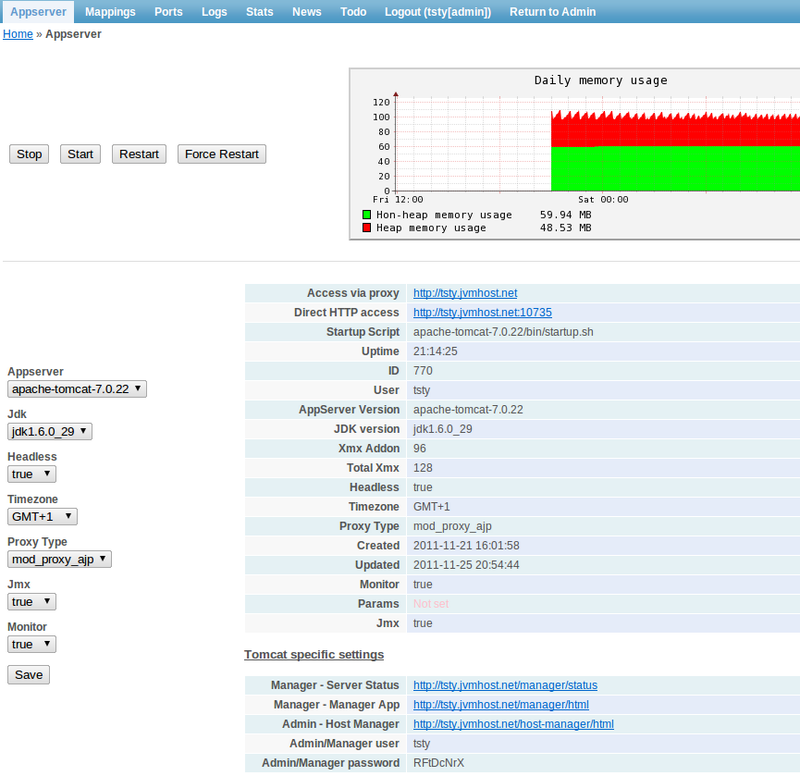 As this is a tiny project we will develop it directly on JVM Host Java hosting server. You will surely prefer to develop your advanced projects locally using an IDE like Eclipse. After you order Tomcat Plus or higher package and receive account details you are almost ready to go with building your first application. 128 MB of heap memory provided with the package is enough for many applications (as we as a Grails host can see), yet you can upgrade heap memory whenever you need. Login to cPanel and JCP panels to familiarize as you will need them later. After logging in to your account via SSH (use Putty on Windows) you are dropped to shell. Here JAVA_HOME is already set. You can change JDK version via JCP if you want. You need to make sure the Tomcat is down, download Grails from their website to home directory and unpack it, create symbolic link, modify PATH variable and add GRAILS_HOME to ~/.bashrc file. It should make some preliminary checks, download some jar files and print available command list. Now we are ready to make a few calls to Grails and end up with a ready to deploy application in WAR archive. Grails comes with embedded Tomcat 6 server but we will use Tomcat 7 running on our dedicated JVM to deploy the WAR in a moment. It will create employees project directory and populate it with application skeleton. Let's add some properties to our class. The properties will be mapped to table columns. After saving instance of the class at runtime the properties will be saved to related table in database. Tables and columns will be automatically created unless they already exist. The constaints property allows for specifying validation rules. We need a controller to handle web requests that come from a browser and generate your user interface. Usually 1 controller handles single URL. It will use ~/employees/tmp as temporary directory. 10735 is your HTTP port as specified in JCP control panel. Also set mapping mode to mod_proxy in JCP. This will allow your alias (e.g. grails.jvmhost.net) to be proxied to the just started embedded Tomcat server wihout a need to specify port in URL. Later, when you have WAR ready you will revert to mod_proxy_ajp. Now open the site replacing localhost with your alias, for example: http://grails.jvmhost.net/employees/ and click the controller - there you can test Create, Modify and Delete actions. Stop the server with Ctrl+C keys. Uncomment the below 2 lines in ~/employees/grails-app/conf/BuildConfig.groovy to enable remote dependency resolution. This way - at application startup - the required MySQL JDBC driver will be downloaded from a repository to ~/.ivy2/cache/mysql/mysql-connector-java/jars directory if missing. Start the application again - this time with production mode data source by specifying prod in command line. If the JDBC driver was not in place you will see download related messages. Start the app and check if your customization is displayed. As you can see hosting side is as easy as it should be, drop in the WAR and access your new site.